St. Patrick’s day is a mere two days away! You have probably noticed the shelves lined with Green, prepared for a day of debauchery, made plans for the Lower Greenville Parade (if you are a Dallas Resident), or maybe you just don’t care! No matter how you feel about St. Patrick’s Day, this is a recipe that you can enjoy. If you are pro St. Patrick’s day use the green food coloring. If you are anti this Irish holiday you can omit that and you will get a white cupcake with just tiny green flakes. T & M are allegedly a small percent Irish, so we MUST celebrate since it’s in our blood. What this likely means is that T will celebrate and M will pretend this holiday doesn’t exist. As a parent, St. Patrick’s day is an interesting holiday because it covers two pretty big extremes. You have the children’s version involving leprechauns, pots of gold, and lucky charms and then you very quickly jump to the green beer shenanigans. There really isn’t much in between. On the kids side, T remembers her mom taking them in the car to chase the pot of gold at the end of the rainbow. There wasn’t always a rainbow on St. Patrick’s day but we would go anytime we saw one. The kids would yell at her to “TURN RIGHT HERE!” “No! It’s getting away from us go faster!” Unfortunately, we never found that pot of gold, but there is always tomorrow. On the adult side, green beer is disgusting. SO replace that with some delicious green key lime cupcakes that you can share with the whole family! We also added some lucky charms on top to really get in the spirit. Do you have any St. Patrick’s day traditions for the whole family you can share with us? Optional: green food coloring, lucky charms! This recipe took about an hour to complete including icing and made 24 cupcakes. Step 1: Preheat your oven to 350 degrees and line your baking tins with the muffin cups. 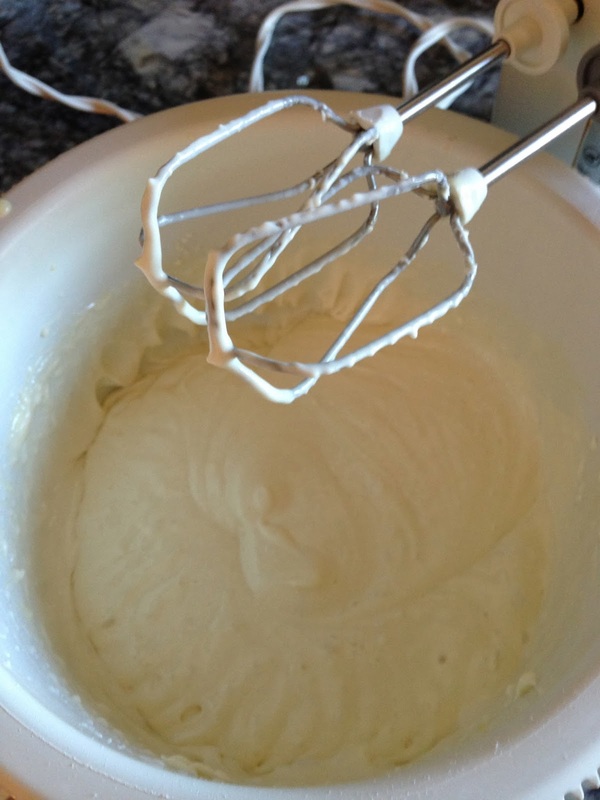 Step 2: In a medium bowl whisk together the Cake Flour, Baking Powder, and Salt. In a separate bowl or measuring cup combine the Milk and Vanilla. Step 3: Drop the butter into your mixer bowl. Beat on a high speed until the butter is creamy. Then slowly add in the sugar and continue to beat until the butter and sugar is combined and looks light and fluffy! Step 4: During this next step you are going to add your wet and dry ingredients one after the other. First add 1/3 of your flour mixture, then 1/2 of your milk mixture, 1/3 of your flour, 1/2 of your milk, and the last 1/3 of flour. Be sure to fully combine the ingredients into the batter before adding the next amount. Step 5: Zest three of your limes and drop the zest into your batter. Cut all 5 limes in half and squeeze the juice into your batter. Beat until combined. Remove this bowl from the mixer stand. (If you want your cupcakes to be green add green food coloring during this stage. The more drops you add the darker it will get). Step 6: Drop your 7 egg whites into a clean bowl. 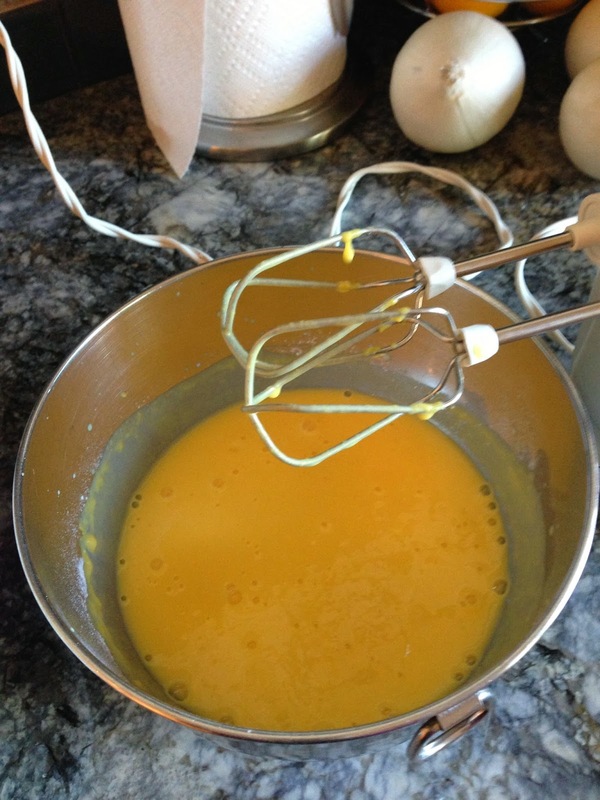 Using the whisk attachment for your mixer beat the egg whites until they are light and fluffy. If you stick a toothpick in and pull it out a stiff peak should form. If so you know you are done. You will then gently FOLD these egg whites into your batter. To fold egg whites into the batter you don’t stir. You use your spatula to pull the batter from the bottom and flip it over the batter on top. Continue doing this until the egg whites are fully combined with the batter. Step 7: pour batter into cups and fill about 3/4 of the way. Then bake in the oven for approximately 20 minutes. You can tell they are done when the rims are golden brown and there is no jiggling in the center of the cupcake. Take out and let cool completely. Step 8: While your cupcakes are baking you can make your buttercream. Add the two sticks of butter to the mixer and beat until creamy. Add about half of the powdered sugar along with the vanilla and juice from two limes. Beat until combined. Continue adding powdered sugar until you reach your desired thickness. Ideally, you want a thick icing that is still easy enough to spread with a knife. Step 9: Add food coloring if desired and beat until combined. When you are ready to go put the icing in a piping bag, a zip lock bag with the corner cut, or just leave to ice with a knife. Step 10: After the cupcakes have COMPLETELY cooled you can ice them and add your lucky charms! Likely you know Valentine’s Day is next week? Some people look forward to the holiday while others dread it. Many of you tout it as a Hallmark holiday. Regardless of your feelings, it is here to stay, so you might as well embrace it instead of being a curmudgeon (M will continue to be a curmudgeon about it). For several years now T has hosted Friendsentine’s Dinner. It started almost a decade ago to make sure everyone felt included on Valentine’s day, much like it was back in elementary school. Really that’s the way it should be! Celebrate all the love in your life not just the romantic one. Typically, our group of friends goes to dinner at a new or “hot” restaurant around town. This year we are headed to Public School 214. Braden and I have been before and we love their bacon cheddar tater tots! T is super excited about dinner, and she always brings a treat with her for all the guests. She had been looking for a fun treat to attach to her Llama themed valentines and went with the recipe below! Meanwhile, M is melting down upstairs because the valentines her kids picked can no longer get here in time for Valentines day. Amazon get it together! You are supposed to be the most amazing shopping center. I guess that’s what happens when every mom in America has that Prime membership. So now we both need valentines and/or treats. SO dun dun dunnah! Enter these delicious Valentines Cookies. This is a recipe idea adapted from a Pinterest find. This sugar cookie recipe is the one T uses for Christmas cookies. It takes NO time to chill, which is amazing. and produces great dough for cookie cutting. So here you go! For all of your Valentine’s needs next week. PSA…be careful. T ate the entire batch…by herself, which was NOT Weight Watchers friendly! Step 1: Preheat your oven to 350 degrees. Using your mixer, beat the butter and sugar until combined. Mixture should be light and fluffy! Step 2: Beat the egg, vanilla, and almond extract into the mixture. Be sure to scrape the sides if needed to ensure all ingredients are thoroughly incorporated. In a separate bowl combine the salt, baking powder, and flour. Step 4: Gather your dough into a ball. Break off half of it and set aside in a bowl. Leave the other half in the mixer. Add your gel food coloring. YOU DON’T NEED MUCH. Add a few drops at a time and mix until fully combined. Add additional drops as needed to get your desired color. (Keep in mind that the final product will be slightly lighter than the color of the dough, so you might go a little darker than you think you need). Step 5: Make alternating balls of dough on your work space. Once all the dough is out. Gently knead the balls together to mix the color. DO NOT OVER KNEAD! T definitely over kneaded and got more pink than swirl cookies. Step 6: Line your cookie sheet with parchment paper. On your workspace roll out the dough to your desired thickness (1/4″ typically works the best). Cut out your shapes and place them on the tray. This was a great, super easy, recipe that produces absolutely stunning cookies. You don’t need to add anything to it but you could sprinkle with sugar crystals to give them a little oomph. P.S. did you know that if you store cookies with a piece of bread they stay fresher longer? Who knew! P.P.S. You can even ADD bread to the cookie container once the cookies have gone a little hard and it will soften them right up. Amazing! It’s that time of year again…SUPERBOWL SUNDAY! Since our beloved Cowboys are not in it (surprise, surprise…) we will mostly be watching for the commercials. BUT there is still an element of excitement surrounding that night whether your team is in it or not. All weekend you see people at the store buying the staples: salsa, chips, beer, burgers, slabs of meat to smoke. The smells from all of the different foods are amazing and everyone is in the spirit. T normally cooks Chili for the big game, but this year wanted to try something a little different. 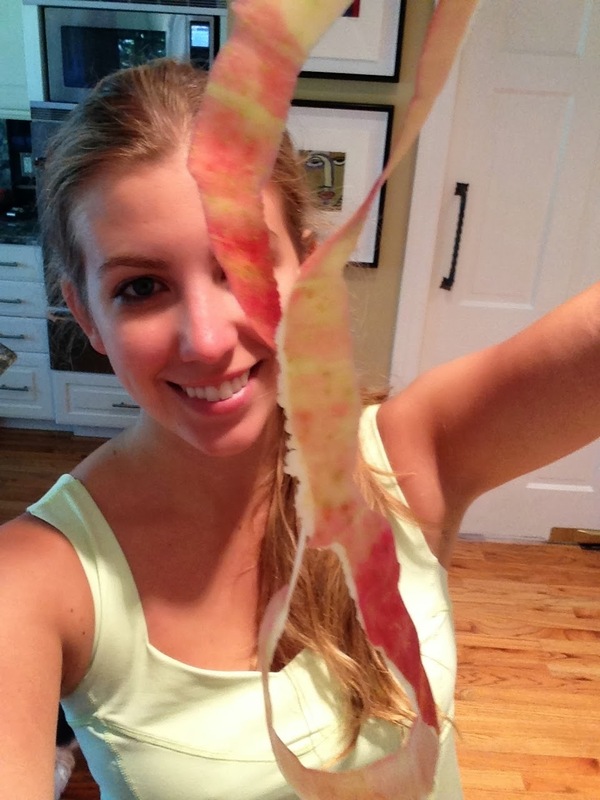 She found a great recipe for Pepperoni Pizza combined with…wait for it… PASTA! WHAT AN AMAZING COMBINATION. The original inventor of this mashup is genius. T would love to give credit to the original inventor but she has no clue where the recipe came from. Regardless, this recipe is actually an adaptation making it a little spicier. But back to the food. Perhaps the best part about this recipe is how fast and easy it was, which also makes it a great option for a weeknight family recipe. T made this version a little spicy, you can reduce that by substituting the Arrabbiata* sauce for regular marinara and replacing the spicy italian sausage for mild or medium. *Arrabbiata sauce is a spicy pasta sauce with a tomato base that can be found along with the other pasta sauces at the store. Step 1: Preheat the oven to 400 degrees. Boil a pot of salted water and cook the penne. While that is going, use a cast iron skillet (or other oven safe pot) to brown the sausage. Step 3: Take 8 of the pepperoni and chop them up. Drop them into the skillet with the Arrabbiata sauce. Stir till combined. 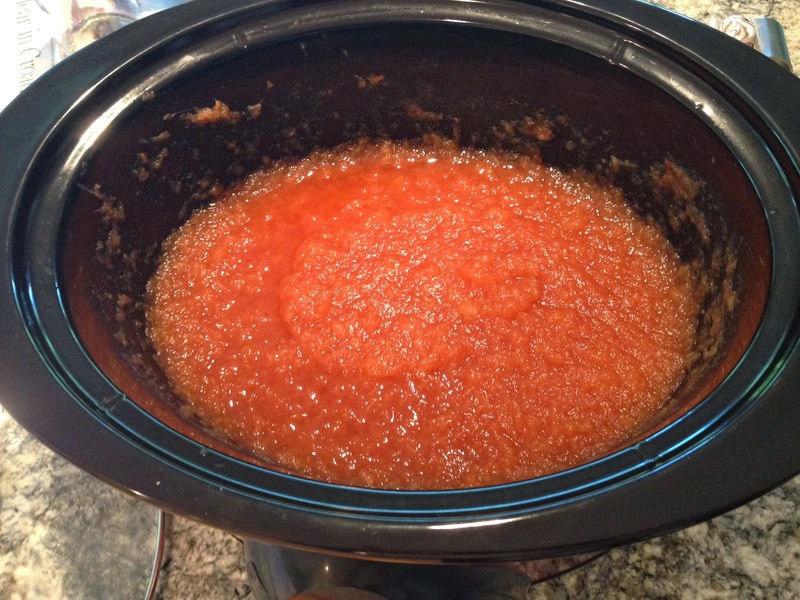 Let simmer for 5-8 minutes allowing the flavors to mix. Step 4: When the pasta is done add it into your sauce and until well combined. Cover with Mozzarella and the remaining pepperoni. Place in the oven and bake for approximately 5 minutes or until cheese is melted and the pepperoni is crispy. Step 5: Take it out, top with your chopped basil, and enjoy! You can also use your broiler if you prefer! T has a few staple meals that are go tos when she is tired or does not feel like making a complicated meal. Bonus points if the recipe is easy enough for her husband to help, or even do it for her if she’s running late. It can be tricky to find meals that take little time and virtually no effort, but they can be found! This gem we’re posting about today is a dish T designed by combining elements from several different pasta dishes. Caution: It is a little spicy, but can be modified to reduce that. T feels like pasta has gotten a bad rap these days because nobody wants carbs. LOL jk. Everybody wants carbs, but avoids them because they aren’t diet friendly. #disagree Pasta can be your friend and it’s filling! This particular recipe is great because you can fill it with vegetables and meat, get a little pasta to satisfy that craving, and not walk away feeling weighed down. Step 1: Bring a pot of water to a boil. Add in the salt. Then add the pasta and cook until al dente. Step 2: While the pasta is cooking, use one tablespoon of your olive oil and saute your broccoli on low-medium heat until tender (3-5 minutes). When done move broccoli to a bowl. Step 3: Use the 2nd tablespoon of olive oil and the same pan as the broccoli. Cook the sausage on medium heat until browned. Use a spatula to break your sausage into desired chunks. Once browned, return the broccoli to the pan and continue to cook on low until sausage is cooked through (5-7 minutes). Step 4: When Pasta is done, drain the pasta and return it to the pan. Pour in the remaining 1/4 C. of olive oil and add the spices. mix until well combined. Then add your vegetables and sausage to the pan. Mix. Step 5: Add the Parmesan either directly into the pan, or scoop the pasta into serving dish and top with the Parmesan. This meal takes no more than 30 minutes, and is delicious! Tis’ the season…to never know what to bring with you to all of those holiday parties! But, whether you are hosting the party or just want to bring a little appetizer, this dish is super easy to make and will be a huge hit. We promise! Cranberries are a super popular food in the winter, both to eat and decorate with. Yet, this little red gem is often discounted by those who don’t know what to do with them. We are here to help with that! Cranberries are gorgeous to look at and very tasty. They are even versatile! Who would have thought to pair cranberries with jalapenos? This particular recipe is a Cranberry Salsa that is a perfect addition to Friendsgiving or holiday party, and we hope you like it! Fair warning…do not rub your eyes after touching the jalapeno. REPEAT! DO NOT TOUCH YOUR EYES AFTER TOUCHING THE JALAPENO! No matter how frequently T uses jalapenos in her recipe she almost always rubs her eyes. The last time she made this recipe her eyes burned for AN HOUR AND A HALF! That’s a rule most of you know, but for any beginner chefs…beware! Step 1: Set the cream cheese on the counter to soften. Chop up the green onion and dice the jalapeno. Step 2: Put the cranberries in a food processor. Use the chop button to get the cranberries as finely diced as you want. The smaller the dice the easier to scoop. Step 4: Right before you are ready to serve. Spread the cream cheese on your serving plate so that it is about a quarter of an inch to half inch layer across the plate. Be sure to leave room at the edge so the cranberries don’t spill over the edge and off the plate. Step 5: Pour the cranberry salsa over the cream cheese and spread it all around! This will seriously be gone in 5 minutes, so if you have a big family you might consider making a double batch. Or two separate batches, that way if no one eats it you can save the other for yourself! It can be served with: Tostitos, Fritos, Wheat Thins, pita chips, or any other chip you like to dip with! I would stick to a relatively bland flavored chip or cracker though because the salsa has so much flavor and you don’t want to take anything away from it. M adds that this appetizer is AMAZING. She does not cook as much and is not as adventurous, but this was still easy to make and so good. She also suggests using a thicker chip/cracker as many chips can’t handle the weight of the dip. But, don’t worry, you can always just scoop it up with a spoon – it’s that good!! As an adult applesauce doesn’t seem like a go too snack. Now that there are kids involved we wonder why that is? Applesauce tastes even better now than it did as a kid. You get a serving a fruit and a little sugar. It’s perfect for anytime you have a little sweet tooth going! P.S.A. it also tastes amazing served warm over ice cream. Don’t knock it till you try it! If none of that convinced you let’s talk about how easy it is. There is literally zero excuse for not trying this. A recipe doesn’t get any easier than this. SO TRY IT. If you don’t have a crock pot go buy one. We will talk to you about why this tool is essential in another post, but bottom line is you can do literally anything in that thing. Oh and p.s…… this recipe is only a whopping 1 weight watcher point per serving!! *Any type. I like to use a combination of Honey crisp and Granny Smith. 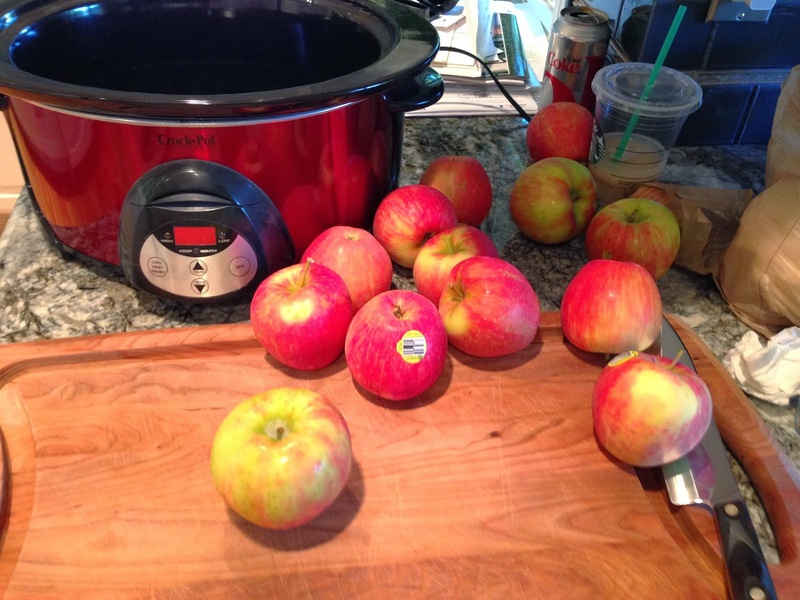 Getting two flavors of apples gives you a more robust flavor. Step 1: Peel, core and chop the apples. To peel it use a vegetable peeler (if you’re lucky you can do it in one long string). Then slice around the core to get 4 large chunks. 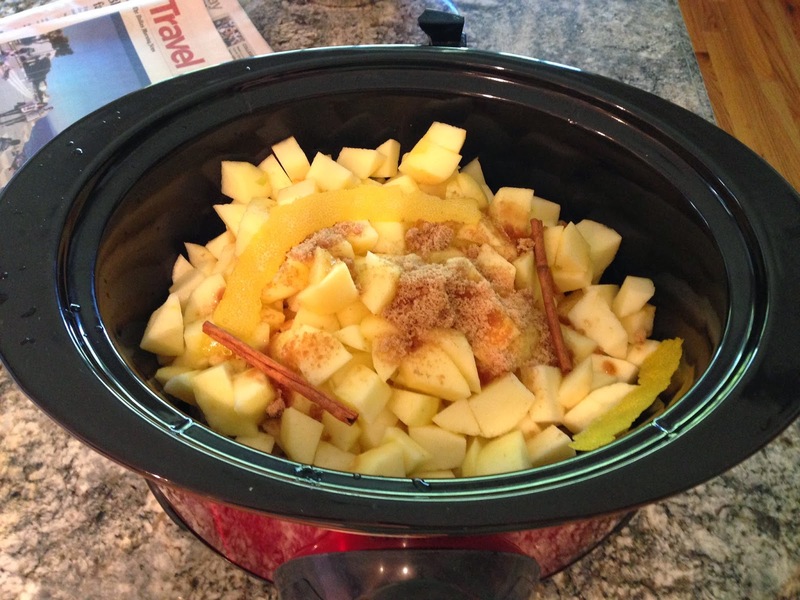 Step 3: Set your crock pot to low and cook for 6 hours. Step 4: Optional. blend your mixture if you want it super smooth or just use a whisk to stir and eat it chunky! 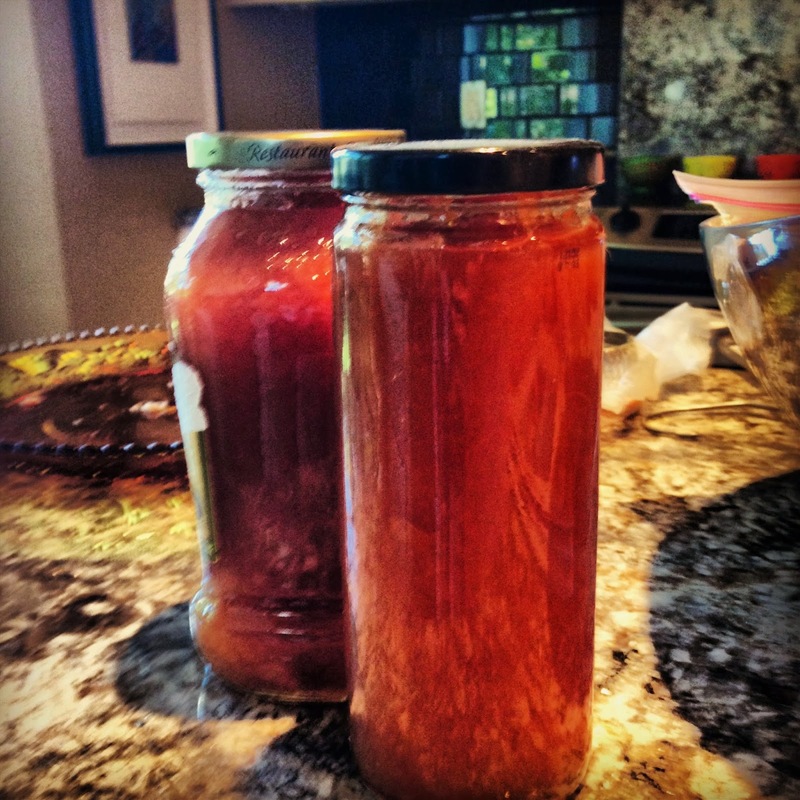 I then put it in old jars like a pasta sauce jar or a salsa jar that’s been thoroughly rinsed out. AND YOU’RE DONE! Congrats on making the bestest, easiest recipe EVER! Don’t be afraid to play with the proportions (adding things or taking things away to get the flavor YOU want) Let me know how it goes! My sister’s birthday is coming up. She passed away six years ago, which is really unbelievable to think about. I’ve made a habit of trying to celebrate her birthday. Partly because I know wherever she is she is partying, so it feels like i’m doing that with her. I’ve shared this recipe in the past, but with her birthday right around the corner I thought it was the perfect opportunity to bring it back. 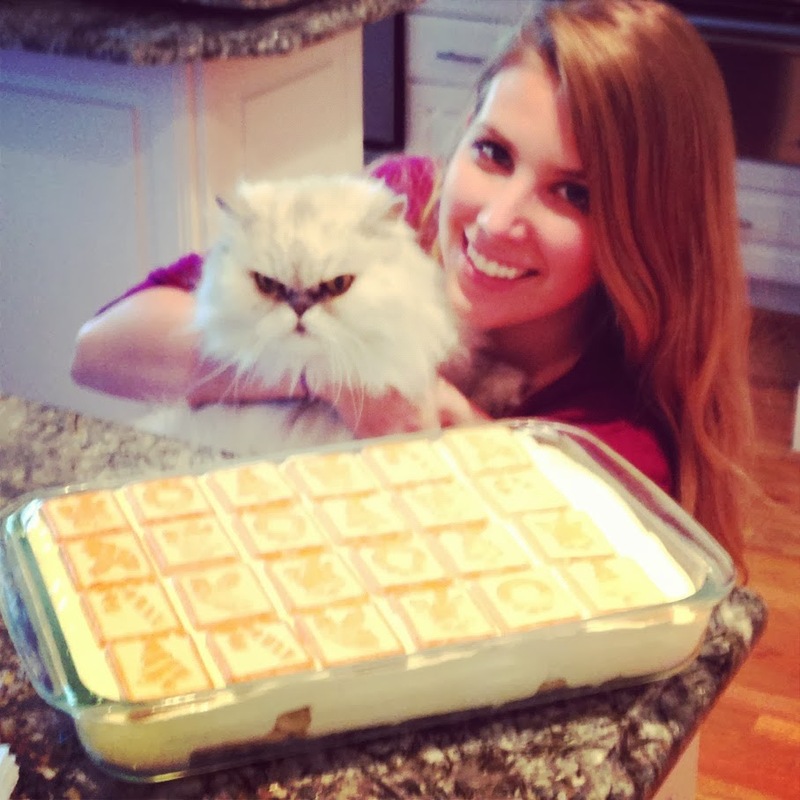 Banana Pudding was one of the few things she and I could ever agree upon. When we were both in school at Fordham in New York City we would go to Magnolia Bakery and buy these giants tubs of banana pudding. And when I say giant I mean it’s like a good 10 servings if not more. We would finish it in one sitting. In fact, I know she could finish it by herself in one sitting. I guess I should share a little back story on this gem of a snack. I guess it all goes back to Black Eyed Pea. We had one down the street and frequently ate there as a family. I don’t think anyone ever ate their meals especially not the vegetables, but we certainly ate that banana pudding. It was a moment where all four of us could come together and appreciate something (that doesn’t happen often). This period was followed by a lull in banana pudding eating. Not to worry though, we more than made up for lost time in New York. Then my mom found this new recipe and it has been a staple in our home ever since. The banana pudding recipe I’m going to share with you is by Paula Deen. Everyone can have their opinion about her, but the lady is a darn good cook. And her banana pudding is absolutely amazing. Lots of southern families have family recipes that have been passed down, but do yourself a favor and give this one a try. It might just become your new favorite. *Make sure to get the seasonal ones for Christmas! 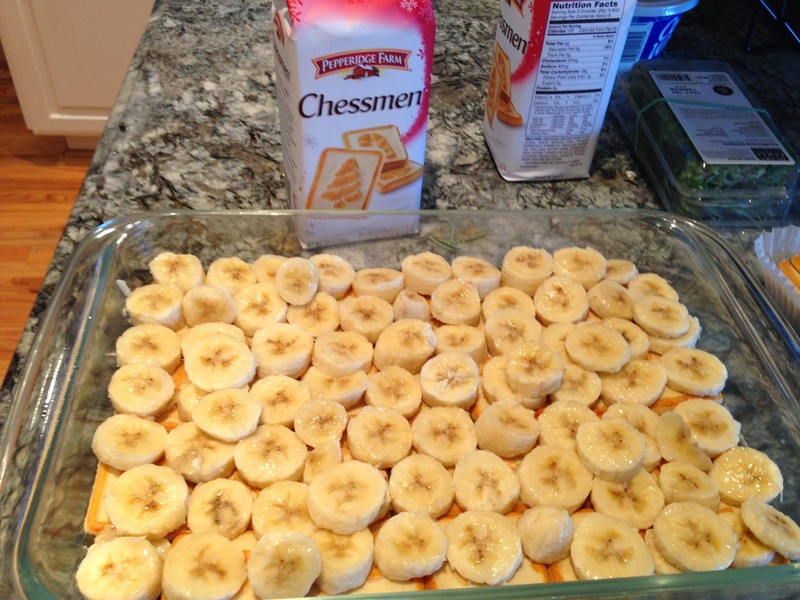 Step 1: Use the cookies to line the bottom of a 13 by 9 inch casserole dish, Then make a second layer with the sliced bananas. Step 2: Blend the milk and pudding mix with an electric mixer. In a separate bowl, mix the cream cheese and condensed milk together until smooth. (DON’T CHEAT! Make sure it’s smooth). 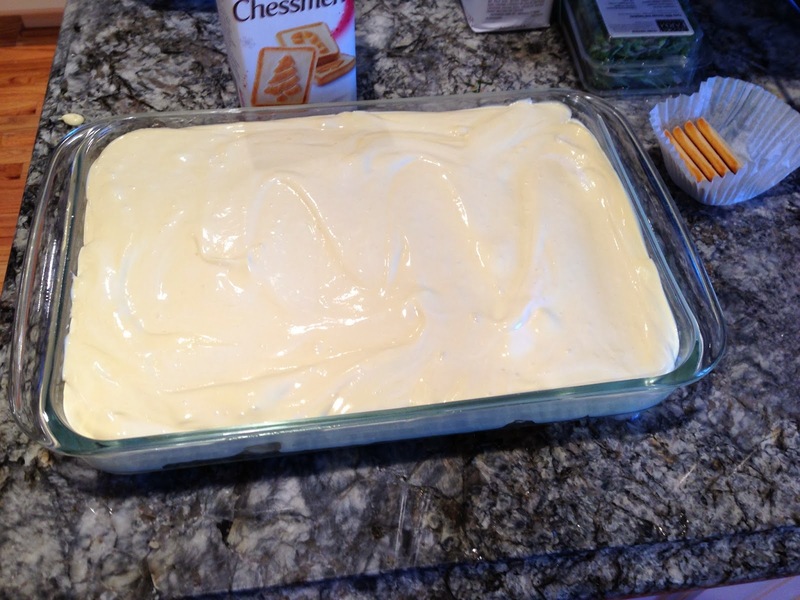 Gently add the cool whip into the cream cheese mixture and then add to the pudding mixture. Stir until completely blended. Step 3: Pour the mixture over the cookies and bananas. Then top it off with a final layer of cookies. Step 4: Refrigerate! You could eat it right away but I suggest refrigerating for 1-2 hours so it gets nice and cool. The way banana pudding should be eaten. I hope you like this recipe as much as I do. It has become a staple in my recipe arsenal, and it is a quick and easy dish to bring to any get together or party you may have especially during this hectic holiday season.